Texas-based importer and distributor MiniLoaders.com (formerly CompactGiant) started distribution of its Intrepid KM100 series compact wheel loaders. 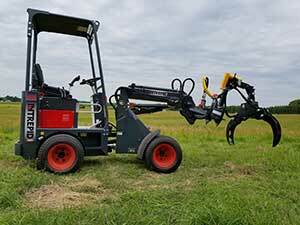 Built by Belgian manufacturer Knikmops, the 25-hp Kubota engine-powered loader uses articulated steering. The machine will come in two variants: a standard boom Intrepid KM100 and the Intrepid KM100 Tele, which features a telescoping boom.